Feasting on Affordable Lobster Treats! Lobsters are such indulgence! Growing up, lobsters are a rare sight. Come to think of it, I never had lobsters till I was after my twenties and had started working. The King of Crustaceans are known for their succulent sweetness coupled with firm and tender meat. One of the best lobsters I had was from Boston from my education years in US. There was something undeniable memorable as I sat by the waters and tucked into steamed live lobsters served just with clarified butter and chippies. Fast forward almost a decade later, one need not empty one’s wallet anymore to feast on the king of crustaceans. Hailing from our neighboring country of Lion City, Pince and Pints has landed on our shores recently in early October this month and has been creating the most luscious gossips around the city. The restaurant focuses on serving classic lobster dishes and indeed, it’s just nothing but lobsters in their menu! While queues are long in Merlion city, Pince and Pints, located in Jalan Telawi 5 in Bangsar, opts to have diners make reservations in advance to avoid having to wait I queues. The 55 seat restaurant has two dinner reservation sessions so one can either opt for an early dinner or a later one. Walk-ins are still allow but you may need to wait if the restaurant are fully booked. 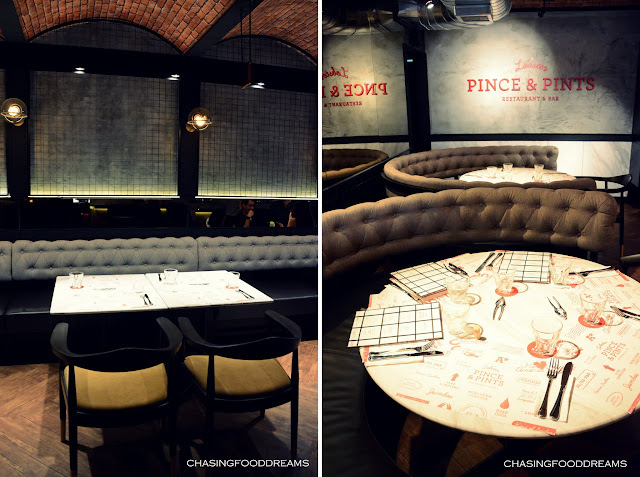 We like how Pince and Pints kept everything to minimal including their sleek décor for affordable lobster feasting. The interior consisted of a sophisticated and yet minimal theme of dark walnut timber finish, marble, bronze and copper elements to be enhanced by the concave brick-lined ceiling and red tiled accent panels. A long bar is set on one side of the dining room to host diners and their pints to unwind for the day. Let’s just say choosing a dish is the easiest one in the city since there are only five lobster dishes in their menu. All lobster dishes are priced at RM158++ per lobster. Their drink list is so much longer and may take more of your musings and debates than that of their food menu. All lobsters are of a minimum size of at least 600gm and above and are flown in direct from Boston, Maine and Canada twice weekly to be kept in special live tanks with state-of-the-art temperature control to ensure that the crustaceans remain in top quality conditions to be served in the restaurant. I sneaked in and caught one live and kickin! Before we feast, we had cocktails… not pints but enough to make me giggly and happy as I waited for my lobster. My partner and I had the Lychee Martini No 32 and Dante’s Dream. At Pince and Pints, cocktails are seriously notated and is curated according to the harmonious flavours of balancing sweet, sour, bitter and dry. My Lychee Martini No 32 was on a sweeter note and tasted of juicy sweet lychees jazzed up with pizazz. Dante’s Dream was refreshing with its gin, cucumber and mint combination, a perfect one to amp up the freshness of the palate. Lobsters arrived and everything else was forgotten. Flashes and camera lens took off, paying homage to the crustaceans before we devour them in pure indulgence. 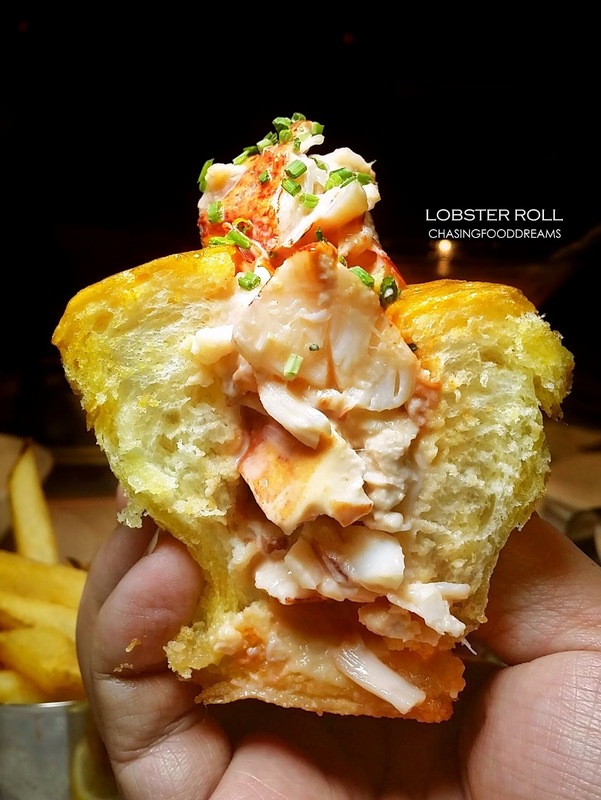 Since Pince and Pints started in Singapore, it is without a doubt that Chili Lobster with Mantou is their signature sensation that appears in most of the tables that night. The Chili Lobster was served in a larget clay pot to allow the dish to be kept warm as one tucks into the divine sweet, spicy and piquant chili sauce in enjoyment. The flavours of the chili sauce sang in harmonious delight from the beautiful balance of tomatoes, lemongrasss, ginger, garlic, chili and egg. The sweetness of the crustacean gave the chili sauce a luscious sweetness. Golden pillows of fried mantou are just meant for the chili sauce. We find ourselves ordering more mantou that evening to ensure that we did the lobster and sauce justice! Another classic Chinese way to prepare lobsters are Lobster Noodles. Made famous in KL and stays in this KL outlet, noodle lovers will rejoice in the sumptuous sweetness of braised egg noodles with large chunks of lobster in a ginger and scallion sauce. The noodles and sauce have soaked up the essence of the crustacean well, making it pleasurable to even slurp up every strand of egg noodles. As mentioned earlier, my fondest memories of lobster was when the lobster was given minimal cooking and flavouring. If you asked me what would one order at Pince and Pints if it’s your first visit, then I would simply recommend the Grilled Live Whole Lobster or Steamed Live Whole Lobster. These two basic cooking method allows the lobster flavours to shine in delicate sweetness. Both dishes are served simply with an herb butter sauce on the side for a creamy, tangy and aromatic boost of flavours. Thick straight cut fries and a side salad are paired with the lobster for fillers. I had the Lobster Roll and was extremely satiated with this dish. Chunks of sublime lobster meat is gently dressed with a thin mayo and cream sauce before stuffing it into an eggy brioche toasted buttery bun. The savory buttery note is simply gorgeous with the sweet lobster chunks. I took my time to enjoy this lavish bun happily. A whole lobster goes into this bun, now is that an indulgence or what? This dish was also served with Garlic Aioli but I didn’t think it needed it since the flavours of the lobster with the bun was already divine. The sauce makes great dipping for the straight cut fries and side salad though. Watermelon cubes in the salad gave this a nice freshness. While one may not be dining at Pince and Pints every day, it is still worth visiting Pince and Pints for an affordable feasting of lobsters! The quality is pretty top-notched and I seemed to have a déjà vu moment when enjoying my lobster here… I better start saving for my next splurge here for their Steamed Lobster and of course that fabulous Chili Lobster…. Ahhh, I was supposed to be going to this tasting as well, glad the food was good. I think the concept is quite similar to Burger & Lobster in UK isn't it?